SUMMARY: The CS50 has proven itself to be an excellent solution for people who have moderate hearing loss and only need a hearing boost in certain situations. There are a couple of issues with the device, but it is a top product that uses cutting edge technology for a really good price. PROS: Functions in a similar way to a hearing aid, but without the cost and traditional design (it looks like a Bluetooth headset. The device and the app are easy to set up and customize the sound level. It has a relatively long battery life of 15 hours. The CS50 by Sound World Solutions is designed for anyone who sometimes needs help hearing, but who doesn’t want a hearing aid. Officially it is considered a personal sound amplifier, but it can also function as a Bluetooth headset for mobile phones allowing users to stream audio and do things like listening to a movie that a user is watching using the earpiece. Although it has a lot of technologically advanced features for a personal hearing amplifier, its primary function is to help people hear in noisy situations, like restaurants or in business meetings, where someone might need a slight hearing boost. 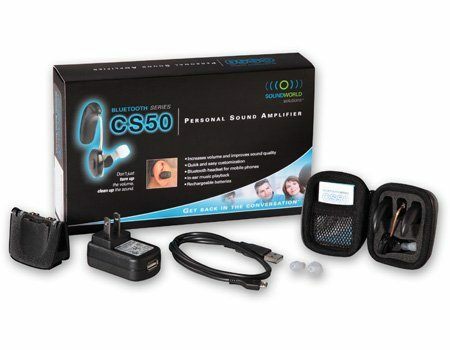 What makes the CS50 different than a lot of the other high end personal hearing devices on the market is the ability to customize and adjust the sound performance of the device to suit your own personal needs. The CS50 uses a lot of technology that you would find in some of the high-end hearing aids. The company uses “proprietary algorithms for digital signal processing, multi-channel input and output compression, and feedback and echo cancellation.” Which just means that it cleans up the sound you don’t hear as much background noise, and you can focus on the sounds that you want to hear. One of the best features of the CS50 is the ability to customize the sound amplification to a level that best suits your own hearing needs. The customization is done through an app that you download to your phone; tablet or computer (must have Apple iOS 7, Android, Windows, or Mac OS X). 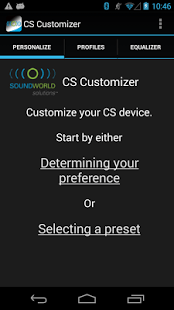 The app takes users through a personalization program to create a customized sound profile. 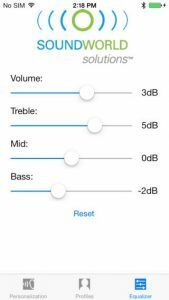 The app also allows users to adjust high, mid, and low frequencies sound to personalize their sound further. Above is a screen shot for the iPhone App, while below is a screen from the Android version of the app. If you click on the “Personalize” tab of the app, the program will take you through the steps in changing the performance of your amplifier to suit your preferences. 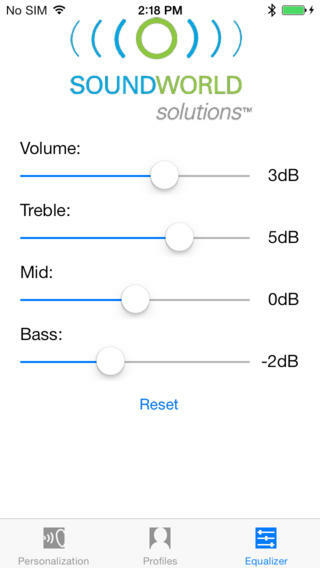 When selecting the “Equalizer” tab sliders are available to le you adjust individual settings for treble, mid, and bass frequencies to tailor your user experience. There is also a slider to adjust the volume. If you select the “Profiles,” you can adjust the baseline setting of your CS50 to one of three pre-set listening profiles, or your profile. You can also select two additional environmental settings designed to optimize the performance of the CS50 in specific situations. The three pre-set options include Base, Restaurant, and Entertainment. The Restaurant setting emphasizes the directional microphone to focus on sounds coming from in front of you and cutting down on the background noise in noisy environments. The Entertainment setting provides increased low-frequency response for a more natural, balanced sound at musical or theatrical events. Sound World Solutions is very clear that the CS50 is a personal hearing amplifier that is not meant to replace traditional hearing aids, but rather it is helpful for situational hearing difficulties that people encounter in noisy environments. A large number of people have trouble hearing when there is background noise or poor sound systems, but their hearing loss isn’t at the level that they need hearing aids. If you only need a hearing boost some of the time, you will find that most audiologist won’t recommend a hearing aid until the hearing loss gets worse. These types of products can be a great solution to situational hearing difficulties. Even though the CS50 isn’t meant to replace a hearing aid, it does use some of the same types of technology as hearing aids such as directionality to reduce the background noise. 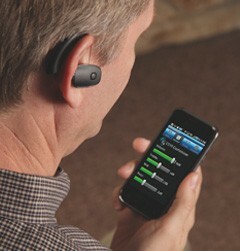 Blue tooth is another feature common to both the CS50 and some hearing aids. Many people who are heard of hearing find Blue tooth to be particularly useful when watching movies or listening to music from a Bluetooth enabled device; it gives just enough customized boost to make these activities more enjoyable. The CS50 is not designed to look like a hearing aid, but rather more like a Bluetooth mobile telephone headset. It is very sleek looking, and it is currently only available in black. Ideally, you will use the app to customize the sound of the device, but you do not need to own a smartphone or tablet to be able to adjust the sound. All of the settings can easily be accessed from the controls on the device. Users with smartphones can achieve a deeper level of programming and control. It is designed to be simple enough to use right out of the box or it is capable of creating a more precise level of customization if the user is interested in that. Each kit contains two rechargeable batteries that can each provide up to 16 hours of listening time on a single charge. It also comes with a charging station where the Batteries can be recharged using either the included power adapter or by connecting the supplied cable to any USB-enabled computer. The ear tips that the package comes with are three different sizes (small, medium, and large) so you can find the right fit for you. They company also offers extra-large tips, but you will need to contact them directly to get those. To store the device, you get a zippered carry case that is a little too big to fit into pants pockets but is useful to store the batteries and the amplifier. If you have hearing loss, but not enough loss to require the use of hearing aids, the CS50 is a good tool to help you hear noisy environments. It has 3 pre-set modes (basic, restaurant, entertainment) that you can access on the device without having to adjust it using the app. If you need more fine tuning you can access the app and set it to your specific hearing needs. You can also use it as a Bluetooth for your phone when watching a video on a computer, or streaming music from a Bluetooth device. Some people with high-frequency hearing loss also find this device useful in cars to help hear a conversation. What is the difference between the CS50 and the CS10? You can stream audio sources like music and audio books from Bluetooth enabled devices. With the improvements the CS50 has a slightly higher prices tag of around $350 while the CS10 sells for about $250. You can buy the CS50 as either a right- or left-ear version for $349.99 per ear. Sound World Solutions offer a 30-day money back guarantee and a 1-year warranty. The company have a great reputation for customer service, so if you have any trouble with the device or find that it doesn’t work well for you it can be returned as long as it is within that 30 period. Company provides excellent customer service and offers a 30-day money back guarantee and a 1-year warranty if product doesn’t work for you. The three different sized ear tips (small, medium, and large) that the set comes with don’t seem to cover all ear sizes, so some users find the fit uncomfortable.